Dental Onlays And Inlays. Z Dental Group - Beverly Hills Dentist, Los Angeles Dentist. Dental inlays and onlays are restorations used to repair rear teeth that have a mild to moderate amount of decay. They can also be used to restore teeth that are cracked or fractured if the damage is not severe enough to require a dental crown. Inlays and onlays are usually made from porcelain, composite resin, and sometimes even from gold. Because they can be created from tooth-colored materials, inlays and onlays are often used to replace metal fillings for patients who desire a more natural looking smile. Read on to find out about how inlays and onlays may be able to enhance your smile's health and appearance. Dental inlays are used to treat teeth that have decay or damage lying within their indented top surfaces. They can also be used to replace old or damaged metal fillings. Inlay placement is usually carried out over two appointments. During your first visit to the dentist, an impression of your tooth will be taken, and a temporary inlay will be placed over the tooth. The dentist will send the impression off to a dental lab, which will create the inlay to match your tooth's specifications. When you return to the dentist's office, the temporary inlay will be removed and the permanent one will be placed carefully over your tooth. There is no downtime after receiving a dental inlay, only a mild level of tenderness in the treated area, so you can return to work or other activities as soon as you leave the office. Since dental inlays and onlays can be made from durable, tooth-colored porcelain, they offer much more enduring and natural-looking results than metal fillings. In addition, their customized nature allows dentists to securely bond them to the tooth surface, adding structural integrity and preventing bacteria from entering and forming cavities. Whereas dental inlays are designed to treat decay within the cusps, or top projections, of a tooth, onlays are used to treat decay that extends to one or more of the cusps. Onlays are placed in much the same way as inlays. First, an impression of the decayed tooth is taken, and a temporary onlay is placed over the tooth. The impression is then sent to a lab, where a dental technician creates the onlay according to the tooth's dimensions. When the patient returns to the dentist's office, the temporary onlay is removed, and the permanent restoration is placed on the tooth and securely bonded using high-strength dental resins. Like dental inlays, onlays can be created from tooth-colored material, which makes them virtually undetectable to the naked eye. 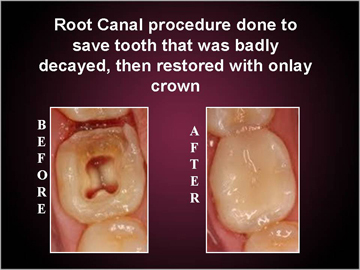 Onlays also help to conserve more tooth structure because their use requires minimal removal a tooth's surface. Perhaps their most important benefit, however, is that, in saving damaged teeth, onlays help patients avoid the eventual need for more extensive treatment with dental crowns, dental bridges, or dental implants. * Since they can be made from tooth-colored material, including porcelain and composite resin, inlays and onlays are virtually invisible. * Unlike metal fillings, inlays and onlays will not expand or contract in response to temperature changes caused by hot or cold foods. This change in size can cause teeth to weaken or fracture. * The use of inlays and onlays requires less tooth reduction than does the use of metal fillings. This allows dentists to conserve more of a patient's natural tooth structure in the treatment process. * Because of the way inlays and onlays are made, they help to strengthen teeth by up to 75 percent. * The durable material from which inlays and onlays are made helps them last up to 30 years, much longer than that of conventional fillings. 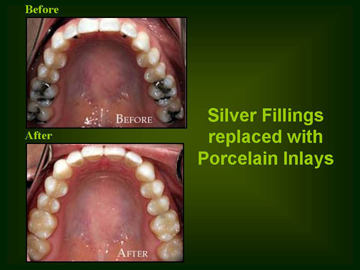 * Inlays and onlays can replace silver fillings to create a healthier, more natural-looking smile. * By saving decayed teeth, inlays and onlays prevent the need for more extensive treatment later on.